Demonstrations in hand sewing teach young learners how their 18th-century counterparts worked at needlecraft. 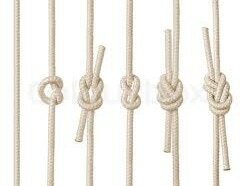 Knots are used for sailing, rock climbing, camping, boating, fishing, surgery, decorating, and many other activities. If you don't have a compass, you can create your own in a few simple steps and take it home with you to enjoy. Inspired by ‘sailor’s valentines’ brought back to Long Island from the Caribbean in the 19th Century. Design your own background or choose from an assortment of sea scenes. The whaling industry was big business on Long Island. Here's how you can try your hand at scrimshaw. Create and build your own powder horn and tricorn hat with inspiration from real 18th century powder horns from the Society’s collection. 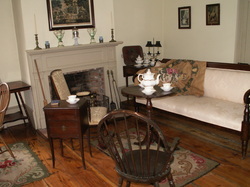 History comes alive when you visit the One Room House and learn how a family worked and played together in a single room. 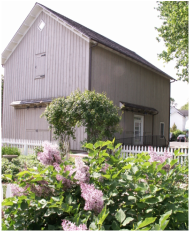 Imagine the comforts of the 19th-century parsonage of the Reverend Marmaduke Earle and his family. See examples of needlework and other fine traditional arts created by the women of the time. Visit this 18th-century herb garden and see what is in bloom or ready for harvest. And who knows, you might even see one of the resident bunnies. Home of the Oyster Bay Historical Society's permanent collections and rotating exhibitions. Find out how the Historical Society cares for its very special collections of textiles, documents, and artifacts.